How do I find your app to sign up for classes and services? Download our app from the apple app store or from google play by searching for “big river yoga”. Use your same email and password you use on our website to log into the app. Do I have to pre-register for classes? Pre-registration is not required. Drop-ins are always welcome, however, some of our classes do fill up. We encourage you to pre-register if you know you are coming to save your space! Classes are on a first come, first serve basis. Please note we reserve the right to give your space to another student if you do not show up before the scheduled start time of class. What forms of payment do you take? We happily accept cash, check, and credit cards including Visa, Master Card, Discover and American Express. We also have an ACH feature that allows you to pay by direct withdrawal from your checking account. Please consider this option when making your payment at our business and at other small businesses in the community! Do you offer reduced price classes or work/study? We do not offer work/study options, however we do offer a reduced price yoga membership for individuals that could use financial support to get to their mat. Can I arrive late? Being late happens to all of us at times. No problem. Please be respectful when you do arrive and come in quietly. Can I attend class If I am sick? Please stay home if you are sick and honor your body, fellow students, and teachers. Drink lots of liquids, get plenty of rest, and wash your hands frequently. Do a gentle practice on your own. What is the chant Chris uses at the beginning of class? The Shanti Mantra is typically chanted at the beginning of class and may again be chanted at the end. 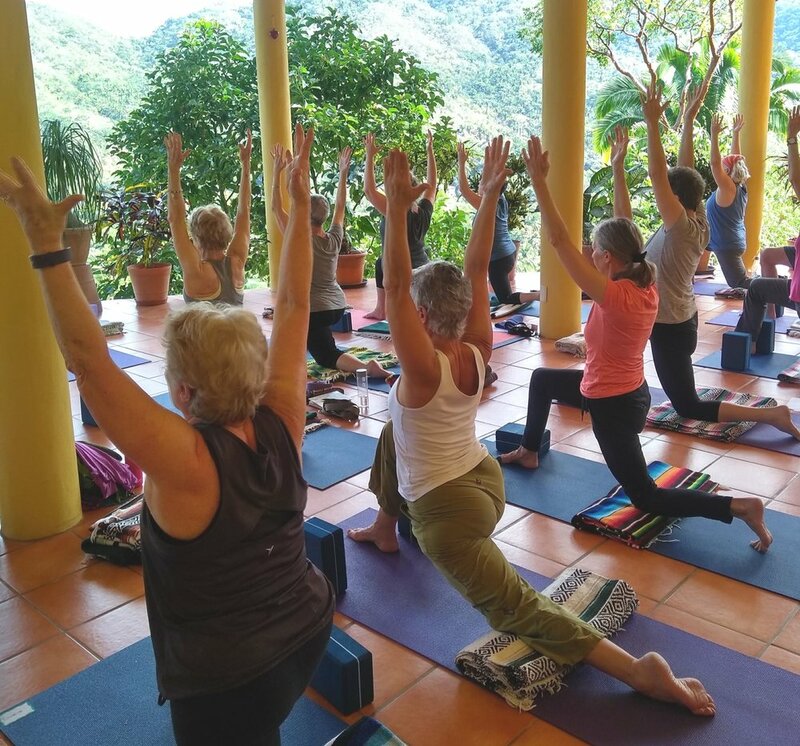 The mantra establishes the yoga studio as a sacred space of peace and learning and invites peace to rain down upon those who practice yoga there. Due to the increasing demand for spots in class, we have adjusted our cancellation policy. We all have days when making it to class becomes a challenge. Please keep this policy in mind on those days! Late Cancellation Policy: If you cancel class within 4 hours of the scheduled start of class, you will be charged a fee. Missed class fee: If you miss class without canceling, you will be charged a fee. Please note this applies to all classes, regardless if they are full. Cancellations must be made online or by the app. We cannot guarantee cancellations made by phone or email. Thank you! If you pre-register for class and do not arrive by the start of class, your spot will be given to someone else if there is a waitlist. If you are pre-registered and know you are going to be late, please call us and we are happy to hold your spot in class for you. Membership can be cancelled with 14 days notice before your next billing cycle starts. Please email info@bigriveryoga. Membership can be suspended for $10 per billing cycle for up to 6 billing cycles per year with 14 days notice. Please email info@bigriveryoga.com. To receive a refund, workshop cancellations require a 24 hour email notification before the workshop starts. All refunds within one week of the workshop start time will incur a $30 administrative fee. Within the 24 hour period and once the workshop begins, all payments are non-refundable. Other policies may apply for long-term trainings and retreats. Those policies will be stated in the workshop/training page. Workshop cancellations must be requested by email to: info@bigriveryoga.com. Workshops and events may occasionally be cancelled by the studio due to illness or low registration. If your event is cancelled, you will be notified by email, and you will receive a full refund or full credit toward your Big River Yoga account if you choose.